September 4, 2012  The auto industry remains one of the economy's brighter spots. 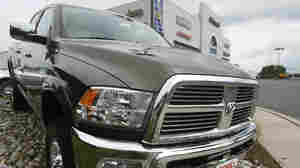 Chrysler's sales were up the most — 14 percent. February 16, 2012  The potential problem for Romney, however, is that even some Republicans, let alone Democrats and many independents, are likely to see GM's financial results as further vindication of the federal bailouts and Obama's approach. 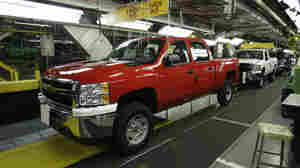 The General Motors Silverado and GMC Sierra heavy-duty pickups assembly line in Flint, Mich..
October 3, 2011  General Motors' sales rose 20 percent. Chrysler's were up 27 percent. Ford's rose 9 percent. For all three, gains in sales of pickups and SUVs were important.